Pacific Gas & Electric has shown it can stop and start plug-in vehicle charging via smart meter and cellular networks—but that’s just the start of its smart grid plug-in plans. It’s little surprise that Pacific Gas & Electric customers own more than 2,200 of the 15,000 or so plug-in electric vehicles in the United States today. After all, the utility serves the eco-conscious, tech-savvy citizens of San Francisco and Silicon Valley -- and in the coming years, PG&E expects its territory to be one of the first to see adoption of plug-in cars en masse. But how to handle all those new plug-ins without investing in expensive new infrastructure to avoid problems like overloaded transformers, grid breakdowns and neighborhood power outages? While PG&E isn’t the only utility facing those questions, it's likely to be one of the first to encounter them in the real world -- and that’s led to a pretty interesting set of projects aimed at solving them through the smart grid. 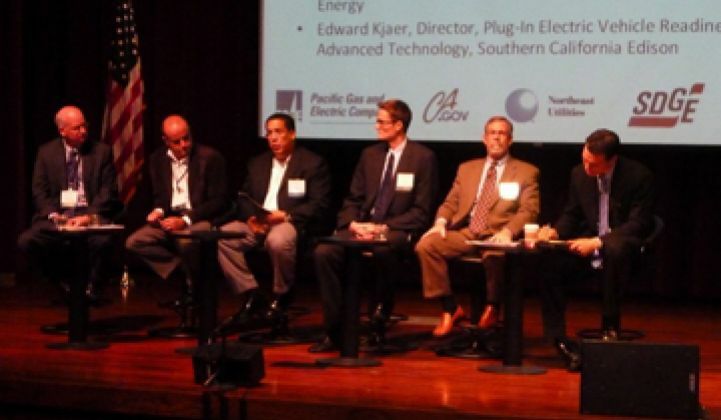 This was part of PG&E’s presentation this morning at Greentech Media’s The Networked EV conference in San Francisco. For the past year, PG&E has been working with smart meter networking partner Silver Spring Networks and car charger makers ClipperCreek and Coulomb Technologies to test its ability to turn plug-in car chargers on and off via utility commands. That project used three “communications methodologies,” Saul Zambrano, PG&E’s director of integrated demand-side management products, told Thursday’s audience -- its Silver Spring smart meter network, ZigBee-enabled home area networks and Coulomb’s cellular network. According to Zambrano, all three communications modes proved their ability to turn chargers on and off and verify the resulting change in power use. Official results of those tests are to be revealed later this year, Zambrano said. In the meantime, PG&E is planning an expansion of the pilot that could put several key propositions of its smart grid-EV plans to test. This next phase, proposed to regulators earlier this year, is aimed at expanding the range of test subjects from two PG&E employees and their plug-ins to about 100 or more plug-in owners, Ulric Kwan, PG&E principal product manager for emerging markets and technologies, told me Thursday. PG&E also intends to use open smart grid standards in the second phase of its pilot, in hopes of including a variety of emerging communications standards in the pool of technologies it’s testing, he said. But more importantly, it’s going to go beyond proving that these systems can “talk” to plug-in vehicles and to each other, and will be tackling the challenge of what to ask them to do with that ability, Kwan said. Let’s break that down into layman's terms. Being able to turn plug-in charging on and off is useful for utilities for a number of reasons. First, it helps them avoid having too many chargers pulling too much power for the local grid to handle. Second, it could help utilities shift charging to off-peak times to take advantage of cheaper power -- something that almost every utility wants to encourage its plug-in-car-owning customers to do. But the smart grid-EV connections could do more than avoid problems, he noted -- they could also serve as assets for positive grid-balancing actions. Take ancillary services -- the business of tapping power generators or reducing power loads to help stabilize the grid. Most plug-in cars don't require a full night’s worth of charging to refill their batteries, Kwan noted. In fact, research from Idaho National Laboratory on Nissan Leaf owners’ charging habits shows that most spend about two hours out of their typical 10- to 11-hour overnight plug-in status not charging at all. While turning chargers completely off might not be a welcome use of that window of opportunity, slightly reducing the level of charging when it’s needed -- say, from full charge to 80 percent -- could help balance those grid fluctuations. Or take a similar process, but in reverse, Kwan continued. Utilities could allow plug-ins to charge at 80 percent most of the time, then use that extra charging capacity to absorb temporary spikes in intermittent wind or solar power that would otherwise threaten to destabilize the grid. All of these next-generation uses of plug-in vehicle batteries could avoid the problems associated with the concept of vehicle-to-grid (V2G) systems that directly tap car batteries to serve the grid, Kwan noted. Drawing power from a battery could shorten the battery’s life and cause warranty tangles -- but simply reducing the level of car charging can accomplish many of the same tasks that V2G is targeting. Even so, this “V2G-lite” approach will present many similar communications and coordination challenges in using car batteries for grid balancing. Say that PG&E wants to devise a program that offers its customers an option to make their plug-in cars available as an ancillary services resource. First, PG&E has to create the technical system to manage the coordination of hundreds or even thousands of car chargers in concert. While this isn’t a simple task, it has been successfully demonstrated in pilot projects in the U.S. and around the world. One big question for PG&E might be whether its smart meter network, which has been built mainly to support hourly meter reads, can send signals fast enough to affect the kind of quick load-shifting that ancillary services require. But that’s not the only challenge. PG&E will also have to interface that real-world power resource to the system used by the California Independent System Operator (CAISO) to manage the ancillary services market. “That’s a really hard problem,” one that's hemmed in by regulatory constraints as well as technical integration challenges, Kwan noted. Beyond that, however, PG&E has to figure out how to involve the utility customers who own plug-ins in the financial rewards of V2G. That’s not a challenge to be overlooked, Kwan said. After all, plug-in car owners own the asset PG&E will be using to benefit its own grid management needs and sell back into the market at the same time. How does a utility figure out what share of those financial benefits belong to the customer? That’s a challenge for future rate cases and future business models.